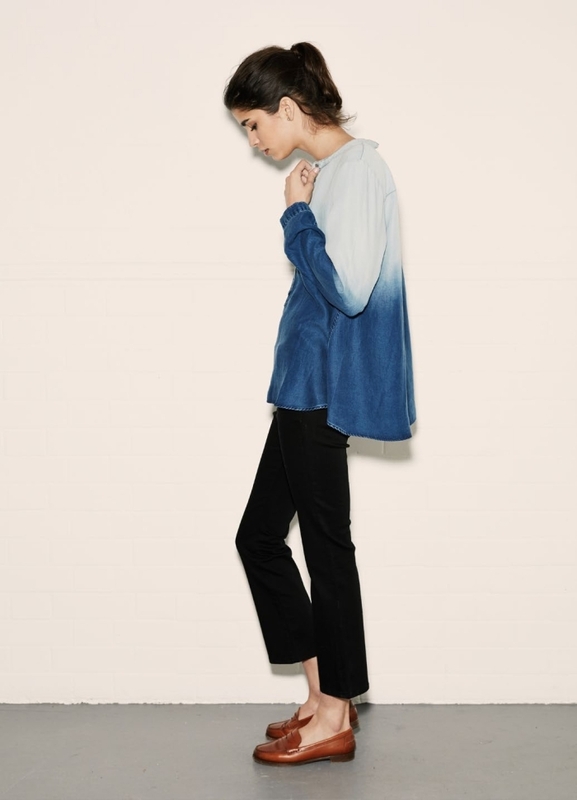 Pre Autumn-Winter 2014; we’re thinking indigo. Contrast stitching, raw edges and washed finishes; reminiscent of authentic 90’s grunge. Each piece cut with slouch and swing to hang effortlessly. The result? A simplified silhouette with tomboy elegance. First to denim and our newest boyfriend addition, the Manchester: an oversized jean sitting low on the hips with a loose straight leg. The Bodycon evolution continues with the introduction of three new fits: the Bodycon Zipper, the Bodycon 5 Pocket and the Bodycon Flare. New cuts join our classic shirting family. The Playing Shirt has a cool, boxy-fit in rinse denim and the Double Pocket Shirt offers a casual slouch in soft chambray. Exploring denim in new contexts: denim has been woven into the structure of our ready-to-wear. The Clean Skirt and Tunic Dress create sleek silhouettes in raw-edged Japanese denim. Touches of our favorite material highlight a cashmere and merino knit with elbow patches. Beautiful knitwear is defined by its natural quality. Using the best alpaca yarns, the Polo Neck Sweater has been delicately knitted with cast-off hems. Chunky knits include the Oversize Shawl. Cardigan: statement volume in textured mohair bouclé. Prints offered in beautifully cut silks are designed to elevate the denim. The indigo Haight print is a layered tapestry design inspired by oriental Kashmir carpets. The outerwear for Pre Autumn-Winter has been built around a denim attitude; the elegant Slim Popper coat and a simplified, cape-cut Trench – the Elliott Coat – made solely from denim. This is tomboy dressing at its most elegant. You can purchase MiH clothes here.